The last thing we want this winter is a new beverage and it's not even warm! Cold brew coffee has hit our high streets just in time for the festive season. Another attempt by the coffee chains to reel us into their store, while they still have the pulling-power that I blogged about last week. So what is cold brew coffee, I can hear some of you ask? It's made by steeping coffee grounds in cold water. It supposedly makes the coffee both smoother and richer. 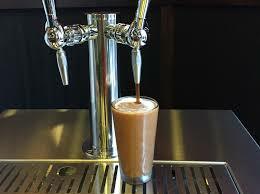 Starbucks and Costa have launched this 'nitro cold brew' - mixing coffee with nitrogen gas and pressurising it so it can be poured from a tap, much like beer is. Some hipsters say that it looks like caffeinated Guinness - a velvety 'crema', as the Italians might say. It seems that soaking the coffee grounds in cold water makes it less acidic than the hot brew. And for the health conscious, there's less caffeine too. 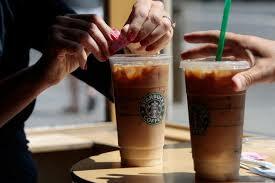 A 16oz cold brew contains about 200mg of caffeine compared to 360mg in a hot brew of the same size. Apparently, you drink this 'smoothy' at room temperature or even over ice, if you're brave enough! While some 'experts' suggest trying it with a cocktail - with gin and a twist of orange peel. I'm not sure about that, Mr Expert. And no, it's not an Italian invention - heaven forbid! This new concoction started in Japan and originated back in the 1600s, eventually finding it's way to Cuba and then the USA. Now, like most food and drink fads, we Brits have taken it on. So how can I try it? I'm not a Starbucks fan and Costa are real 'rip-off' coffee merchants. Well, the supermarkets too have decided to cash-in on the new craze. You can get Sandows canned cold brew coffee in cans at Ocado and Whole Foods, only £13 for six cans! What, over £2 a can? And there's more - why not brew nitro cold coffee at home - the Nitro Cold Coffee Dispenser from coffeehit.co.uk will only cost you £3,960!